The U.S. stock market’s rally from its dismal start to the year appears to be a classic investor trap. Many investors have the tendency to jump in a bit too early on first signs of improvement in economic indicators or positive news. But the markets are primed to trap the solvent investors and fool the most rational among us. Nowadays, in a world of high-frequency trading and speculative derivatives, it is hard for even the most experienced investors to stay rational, let alone be clear on whether to buy or hold or sell. This is why so many experts on Wall Street are giving so much conflicting advice. Current forecasting science and predictive models are not yet developed enough to time the market for the next month or quarter. What is clear is that even though stock markets have not been hit as expected, it is not safe to jump all-in. At the International Institute of Management, our stock-market predictive model flashed a red alert in the second-quarter of 2015, indicating a double-digit decline. If current central bank policies and financial market trends continue, we could see a severe market correction either in 2016 or 2017. This year investors have worried about China, oil prices, terrorism, Brexit, and the outcome of the U.S. presidential election, but few are paying enough attention to currency and derivative risks. The Federal Reserve’s interest rate decision-model places more weight on inflation than financial market risks. Fed Chairwoman Janet Yellen was wrong not to raise rates in 2013 to brake high-risk consumer and corporate debt and the stock market bubble. On the other hand she was right not to raise interest rates this March, as this reduced the risk of an international currency crisis, even if that was not the main goal. Yet if the Fed raises rates while other central banks keep lower or negative interest rates, this will increase the risk of capital outflow from those countries to the U.S., causing a major decline in those countries’ stock markets. Currency traders in turn will short those currencies, and hedge funds will short those stock markets. This scenario could happen quickly, with lasting impact. The global foreign-exchange market dwarfs the stock and bond markets. Forex trades more than $5 trillion a day. More than 80% of this volume is generated by currency speculators who can swoop in and rapidly capitalize on misdirected policies. This is what happened in 1997 with the Asian financial crisis and could happen again. High-risk countries are the ones burdened with excessive debt, high net-external debt, and lower interest rates compared to other countries. But what if the Fed decides to cut interest rates instead? Then the risk of intensifying currency wars increases in order to compete for international exports. In price wars, be it oil or currency, the parties involved lose the most. Central banks now are caught between a bad choice and a worse one. If the timing and the size of their actions are not properly calibrated and synchronized, you can expect havoc in the global financial markets. To be sure, the U.S. dollar DXY, -0.02% is strong and the U.S. economy is growing. But in a global economy, no country — even the U.S. — is immune from its trading partners. In a trade war, it will not take long before the U.S. financial markets are negatively impacted. The majority of the S&P 500 SPX, -0.10% companies generate substantial export revenues; accordingly, U.S. stocks and the economy cannot escape a hit for long. The International Institute of Management’s forecasting model showed that fewer than 20% of publicly listed companies on major U.S. stock exchanges grew sales and profits in 2015 over 2014, while the rest stagnated — i.e. sales or profits were flat or declining. Large-cap companies fared better than mid- and small-caps. But if large companies cannot find a way to grow, some market sectors could decline by 20% or more this year or in 2017 from their highs. Yet in this recent market rally, many investors see good economic data, more supportive central banks, and believe they are buying a dip. Moreover, U.S. consumer and corporate debt, debt derivatives, currency, and the European Union pose real threats to investors. About $10 trillion of corporate debt in the U.S. alone is due over the next five years, and about 30% of this total is high-risk. Risky debt of $3 trillion can impact the U.S. financial markets, whether the Fed or the banks want to admit it or not. Add to that the derivative markets and you get a completely different picture. To put the risk in perspective, the size of the global stock markets is estimated at $30 trillion to $40 trillion, of which about $20 trillion reflects the U.S. stock market. However, the derivatives market — future bets on the price of bonds, commodities, or the stock market indices and ETFs — is estimated at $800 trillion globally. The U.S. derivative market is estimated at $300 to 400 trillion. That is 10- to 20 times the size of the U.S. stock market. Unlike standard loans and stock investments that actually help grow an economy, derivatives are a zero-sum game. It is exactly like playing in a casino, one must lose for someone else to win. Derivatives are a wealth-transfer tool from the uninformed, unsuspecting investor, saver, or retiree to informed market insiders. So, even if banks can avoid losses on derivative bets, investors still get hit. Derivatives explain why so many Americans lost value in their homes, retirement accounts, and life savings after the 2008-09 crash. The news media reported that more than $5 trillion disappeared from the market in that downturn. But the money did not just disappear — that would be against the law of physics. It only got transferred from the masses to the few. If this happens again, extreme civic unrest could damage global financial markets for a long time. When the potential damage can be so large, some regulation is needed to protect Main Street from the massive gambling instruments of Wall Street. Yet central banks and mainstream economists tell investors and businesses not to worry and go ahead with investing and spending, while central banks do what they can to support economies and markets. Except that central banks have reached a limit. If conditions remain the same, annualized stock returns for most investors will be in single-digits at best, and more likely in negative double-digits. Investors would be wise to take measures now to preserve capital rather than invest aggressively at every market dip. An essay on debt that I disagree with. 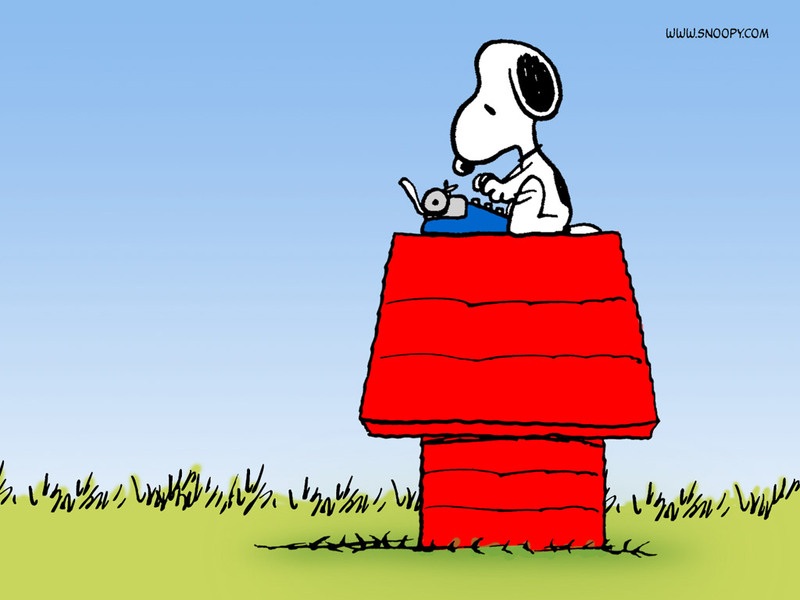 I haven’t been over to Armo’s blog for a while. Jerry as usual is way off. Republican Vice-presidential candidate Paul Ryan is set to debate Vice-President Joe Biden on Thursday night. While I am not sure if he will exactly talk about, I am sure he will mention the national debt. 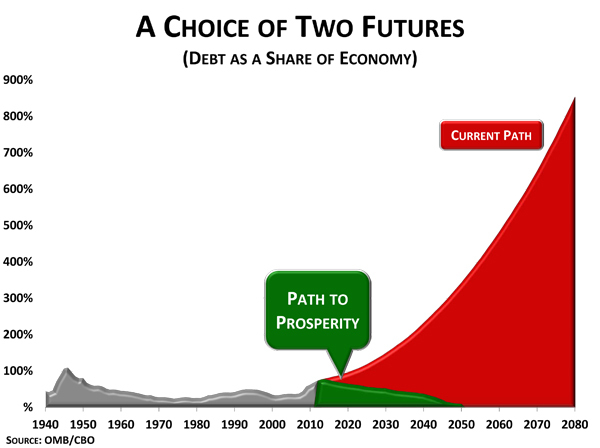 In his “Path to Prosperity” budget, Ryan has an amazing chart that shows what our debt would be if we continued in our current path compared to what the debt would be if we adopted his plan. Here’s the famous chart. It shows debt skyrocketing to nearly 900% of GDP in 2080! Armo is not overly impressed. Wow, Paul Ryan was able to project debt all the way to 2080, which is nearly 70 years away! He must be an amazing debt projectionist/forecaster. Don’t disagree here. Projections are notoriously difficult and almost invariably are wrong. OK, enough of the sarcasm. 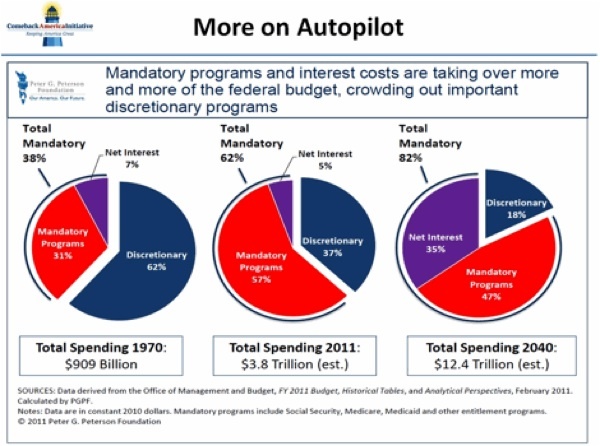 I’m sorry to break this Paul Ryan, but this chart is ridiculous in many ways. First off, it ignores what national debt is. If the US Federal Government owes debt, someone must OWN it. Guess which 2 sectors own the national debt? The foreign and private sector. Well yes the foreign and private sectors do own government debt. So does the government however. The Federal Reserve has also been buying government debt. The foreign sector owns US debt mainly because of trade balances. When a country like China holds nearly half of the foreign holdings, there is a reason behind it. They run a trade surplus with the US, and because of that, they have all these US dollars lying around. 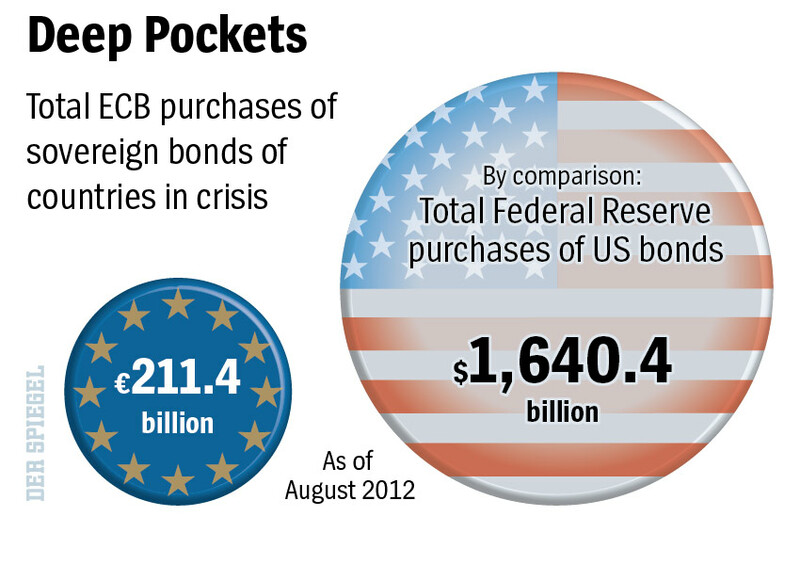 They can either go out and use it to buy resources, or they can put it in the safest asset out there, US bonds. This post clearly explains this process. Armo has a view. He seems unable to move past that view. True China and the US have run trade imbalances. That is to say the US has imported in excess of what they have exported to China. Where did all the dollars come from with which to purchase these Chinese imports? They were not earned through selling exports to China. They were either created [printed] or borrowed. In this case they were borrowed from the Chinese. So China didn’t have all these US dollars lying around, the US borrowed the dollars. This leaves the private sector. Basic accounting identity tells us that the national debt is (net) private savings. And as I’ve blogged about in the past, to reduce the national debt is to reduce net private savings. Insufficient net private savings usually lead to a recession (see how a drop is usually followed by a recession?). This is Cullen’s Chartalist nonsense. 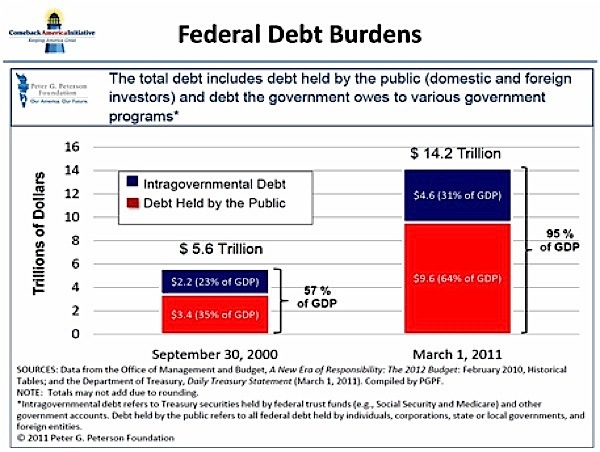 The private savings is in part constituted of the government debt held by private holders…true. To reduce the national debt however is not to reduce savings when part of the national debt is held by owners other than private individuals. Incorrect. Anyway, the point here isn’t to debunk Paul Ryan’s chart and why it makes no economic sense. My point is to show how absurd it is to project debt 70 years into the future. Just as well, as you have signally failed to do so. Well I agree that projections into the future are fraught with difficulty. Seventy years into the future, and you can just about guarantee that they will be wrong. First off, to project future liabilities is to put it frankly, dumb. No not really. The important point is not the final value of the liabilities, rather the direction of the trend with a given set of policies. These policies are entrenched in law. They are not that easy to shake off. Social Security, Medicare, Medicaid, these are liabilities enshrined in law, that are growing as the demographics move against the US. Then consider interest rates. Currently interest rates are at all-time historic lows. This has been accomplished via the Federal Reserve, not the free market. If the Federal Reserve were to remove this support and allow the free market to set rates, the rates would be higher and the liabilities on that debt, due to the rise in interest rates, would increase dramatically. Whether the liabilities reach that, exceed that, or fall below, is not critically important at this point. What is important is the direction of the trend. This takes on additional significance when real growth is extrapolated. 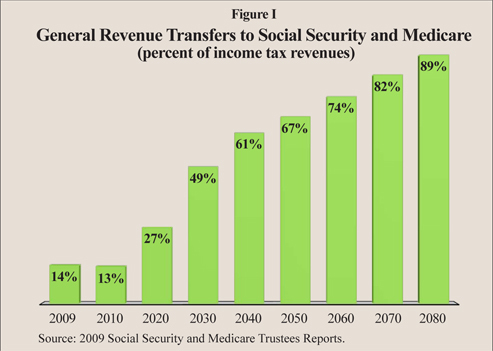 Secondly, it is insanely HARD to project debt in the near future, let alone 70 years into it! Think its easy? 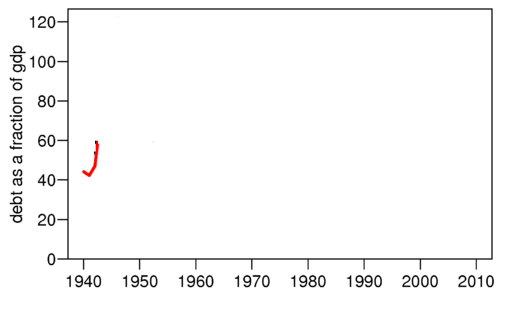 Here’s a Debt/GDP chart since ~1940 (about 70 years back). Try drawing the path for the last 70 years. Given that you might even slightly know the estimated path of the chart, it’ll still be hard to draw it to close proximation – and you’re even using historical facts to help you! Now imagine not even knowing that, it is nearly impossible. Obviously for you it is an issue. This is a simple matter for someone versed in math. Now whether the accuracy is there, I already agree that it will almost certainly be off, but the direction of the trend is not at issue. To conclude, projecting debt is dumb, impossible, fear-mongering and a useless political game. Stick to figuring out a way to get us growing again. Far from it. Highlighting the unsustainable trajectory of debt growth, given current policies, is actually very valuable, unfortunately, probably due to your Chartalistic ideology, you are simply blind to economic reality.